On March 3rd, 2016, Black Desert Online launched, embarking on an epic adventure in North America and Europe. To commemorate our 2nd anniversary of this special day, we have prepared several awesome events over the following weeks, released the Absolute Skills for all classes, and included a special Appreciation Gift in the in-game mail to commemorate this exciting day! Find out additional details on all the changes being introduced this week below. “Absolute” Skills have been added for All Classes. After completing the Awakening Weapon quests at Lv.56, Absolute Skills can be learned through the Skill window > Main. In order to learn Absolute Skills, the relevant Skills must first be levelled up to their maximum. Absolute Skills inflict more damage and hits than regular Main Weapon Skills. Find Absolute Skill additions below under Class category or check < Here > for full details. A new search function has been added to the Alchemy and Cooking windows. Knowledge filtering function and search function has been added while performing Alchemy and Cooking. Click on the “Learned Recipe/Alchemy” box to filter to view only the ones that you have knowledge of. Enter a word into the search field and all the Knowledges that contain the word will be displayed. When using the search function, only Knowledges you have already obtained will be displayed. When searching for a Knowledge you have not obtained, it will display a message letting you know that there is no Knowledge that contains the search phrase. Equipment items and Pearl Shop items can no longer be used as an ingredient for Alchemy and Cooking. A Guild Expense system has been added. This system will allow the Guild Master to set the MAX amount of Guild Funds any guild member can spend when purchasing from the Guild Shop. Guild Masters can set an individual Guild Member’s spend amount by clicking on the individual’s name from the Guild Member Status UI. The spending amount of a Guild Member can be set, the default being 0. If desired, no limit can be set for a member. Once a Guild Member has depleted their allocated Expense funds, no further purchases can be made until the amount has been reset by the Guild Master, which can be done at any time. Guild Funds can be used at the Guild Shop or Guild Military Supply Manager NPC’s. Guild members, depending on their rank, will be allowed to purchase Guild Items and make use of the Guild Storage System as before. This has not been changed. The recent price of items on the Marketplace will be reset during every maintenance. The recent price after every maintenance will not be displayed until the very first transaction of the item has been completed. The Cooldown (1 sec.) has been removed for: continuously moving items from the Mount Inventory or Campsite Store; or continuously switching your Main Weapon. Fixed the issue where the Hwacha and Flame Towers would not fire intermittently during Conquest/Node Wars. On behalf of the Black Desert Online team, we’d like to extend our gratitude for joining us on this adventure. To show our appreciation for the affection and dedication you’ve shown us, we are sending out an ‘[Event] Appreciation Gift’ via in-game mail to every adventurer during the maintenance on February 28th, 2018. Please claim your ‘Event Appreciation Gift’ before maintenance on March 14th, 2018. Red Nose’s Armor, Giath’s Helmet, Bheg’s Gloves, Muskan’s Shoes, Dim Tree Spirit’s Armor, Griffon’s Helmet, Urugon’s Shoes, Kzarka’s Sealed Weapon Box, Nouver’s Sealed Sub-weapon Box, Kutum’s Sealed Sub-weapon Box, Dandelion Weapon Box. Discount Coupons will be given out to all Adventurers who log in. Coupons are valid until March 14th, 08:59 UTC. To commemorate the addition of Absolute Skills, Armstrong’s Skill Guide (1 Day) will be available on sale for a limited period. Special 20 pearl items have been included in the Pearl Shop for a limited period. Selected Pearl Shop Categories are on Sale! Lavientia’s Accessory event has been added. Event Period: February 28th (After Maintenance) ~ March 21st (At the start of Maintenance). During the event period, Defeat monsters, Gather, and Fish to obtain a variety of event items. During the event period (from Mar. 1st 00:00 UTC ~ Mar. 21st Before Maintenance), play 1 hour daily and receive rewards through the Challenges (Y) tab. Click < Here > for details on this glamorous event. Seven New Event Challenges (Y) for Rookie Adventurers have been added to the game. Event Period: February 28th (After Maintenance) ~ April 25th (Before Maintenance). Only Rookie Adventurers with less than 1440 total minutes of gameplay time are eligible to complete special Challenges for rewards. Adventurers who have already completed the 1st Day Challenge are then eligible to progress through the 2nd ~ 7th Day Challenges for more rewards. Special EXP Boost event will be held in commemoration of the 2nd anniversary! A fascinating array of fireworks will light up the dark skies in Velia, Heidel, and Calpheon City to celebrate our 2nd year together! All Valentine’s themed decorations in the game world have been removed. The “Lovely Drop Event” which increased the drop rate for Hard and Sharp Black Crystal Shards has come to an end and drop rate has returned to normal. The Valentine’s Day Events “Love in a Bottle” & “Chocolate Fun” has ended. The new 3D Minimap feature has been added. The button on the upper left-hand corner indicates the type of Minimap you are currently using. Press it to toggle between 2D and 3D. Your Minimap setting (2D or 3D) will be maintained even after reconnecting to the game. Thanks to the 3D Minimap, you will not only be able to see the topography of the landscape from your Character’s viewpoint but also have a 360-degree view of the topography around you on the map. You will be able to see the 3D topography in the Desert and Great Ocean as well. However, buildings there will not be marked on the 3D Minimap while in these areas. The 3D Minimap does not give directional cues for the location of your Quests or Party members. However, location identification marks to show Quest objective regions and other special areas, such as locations marked by Pet alerts are planned to be added in the future. Settings > Game > Etc. > Misc. > Rotate Minimap to add even more functionality to the 3D Minimap. Fixed the graphical issue in Mediah Castle where a part of the grass appeared to be floating. Invisible walls at Mediah Castle have been removed. Objects in Sausan Garrison that could be passed through have been removed. Pillars have been added inside the Hystria Ruins. The insides of the Hystria Ruins has been redesigned to contain less obstructions and improve ease of navigation while defeating monsters in the area. The wagon located at the entrance of Kamasylve Temple has been removed. Effects that are too close to the camera will not be displayed. Fixed the graphical issue that would prevent certain skill effects from correctly displaying when the ‘Hit Effects’ setting was disabled. The Gateway at the Closed Western Gateway Node, which was previously closed has now been opened, as a result of this the name of the node has been changed to Serendia Western Gateway. Fixed the graphical glitch in certain areas of the Gyfin Rhasia Temple that would cause the screen to display underwater effects. NPC Guards that were occasionally attacking characters with positive Karma Points have been fixed. Stamina consumption while Sprinting in the Awakening Weapon stance has been decreased by about 25%. Fixed the issue where the skill ‘Flow: Piercing Wind’ was consuming more Stamina than intended. Description of the Skill Shadow Kick has been modified. Stiffness and Down Smash are not applied during the cooldown time. The issue where the Air Attack effect was not applied while using the Skill Dark Flame twice has been fixed. “Pushes the target on lateral attacks (PvE Only)” has been added to the description of Berserker’s Skill Buster Training. The issue where the damage from Tackling Rock was not applied correctly according to the Skill’s level has been fixed. If a monster dies from the Tamer’s first hit of the skill ‘Tree Climb’, Tamer will now move backwards in midair and land on the ground so additional combos can be performed. The skill command for ‘Heilang: Trample’ can now be locked. Fixed the issue where Celestial Bo Staff stance would unintentionally switch to Short Sword stance while using the skill ‘Legendary Beast’s Power’ in an area with a difference in elevation. Fixed the issue where Celestial Bo Staff would not switch to the Short Sword combat stance when using the skill ‘Legendary Beast’s Power’, followed by the skill ‘Bolt Wave’ from a Quick Slot without having obtained the skill ‘Ultimate: Bolt Wave’. Corrected the skill description for ‘Flow: Scatter Stance’ to display the correct Preceding Skill name. The issue where some descriptions of Main Weapon Skills did not mention their HP/MP recovery effects has been fixed. Fixed the issue where the cooldown time of the skill ‘Flurry of Kicks’ was activated simultaneously with either ‘Divine Power’ or ‘Righteous Charge’ after using the skill ‘Celestial Spear’. Fixed the issue where Stamina was not properly consumed when Sprinting and consistently switching between Aad Sphera to Main Weapon stance. Fixed the issue where Stamina was not properly consumed when Sprinting and consistently switching between Godr Sphera to Main Weapon stance. Improved the neck movement of the Wizard’s when looking up at the camera. Forward Guard has been added to the skill ‘Flow: Mach Explosion’. Striker’s skill ‘Heavy Fist’ will now properly display effects when mounted on a horse. Fixed the abnormal motion of the Striker when attacked while using the skill ‘Flow: Crosswind’. Fixed the abnormal motion when landing from certain heights when performing the skill ‘Flow: Crosswind’. Fixed the graphical issue where Striker appeared to be underwater inside a cave at Demi Riverhead during the Awakening Weapon quest. These items expire within 15 days of purchase, and can be purchased with Guild Funds by any Guild Member. Please Note: You must have enough Guild Expenses available to cover the costs when buying the item(s). Fixed the issue where Crystal information used on equipment in a Quick Slot was not displayed. Equipped items that are expired no longer appear on your Character in the Knowledge and Pearl Shop UI. The MAX price and MIN price of Pearl Items registered in the Marketplace will not decrease if there are less than 10 items in stock. Fixed the issue in the description of the Grolia Hat, where it did not mention any information about the Outfit’s slot effect. Pearl Shop categories have been rearranged and renamed. Please find Rookie and Skilled sub-categories under Black Spirit’s Pick tab which will offer items suitable for new and skilled adventurers. Costume tab has been placed as a sub-category under Outfit category. This is due to the recent revisions in the outfit/costume section that made a clear distinction between (regular) outfits and functional Costumes. A new ‘Travel Aid’ tab has been added to display items that can help new adventurers get accustomed to the game. Tabs like ‘FEED’ and ‘HORSE FLUTE’ have been renamed or combined with other tabs. A new feature where you can choose from a selection of items and purchase your own bundle/package at a discounted price. Choose from the available items and explore the possibilities! Currently available with [2nd Anniversary] Fluffy Friends Pack. For details on newly added Pearl Shop items and the 2nd Anniversary Sale, please click < Here > ! 3 New quests have been added to the Serendia Western Gateway location. Characters level 21 or higher can proceed to NPC ‘Batuetta’ and interact to initiate the quest. You can now gain “Happy Batuetta” Knowledge while performing the related quests. Training EXP is now rewarded after completing the quest [Training] In Search of the Finest Courser. A Newly revamped UI and ESC Menu have been added. Switch to the new UI by pressing the Switch Menu button located on the bottom of the original ESC Menu. Newly created accounts will have this new ESC UI Menu on by default while others will need to enable it by using the button located at the bottom of the current ESC Menu. Please Note: To return to the old UI from the new ESC Menu, press the ‘Switch Menu’ button located on the upper right-hand corner of the new ESC Menu. You can adjust which side the new ESC Menu will open from (Left or Right side of screen), via the option “Open from the right” or “Open from the left” on the upper left hand side of the new ESC Menu. Knowledge Base, Escape, Inventory, Setting Archive, Pearl Shop, Quick Hotkey, Settings, and Disconnect. The Enhancement window has been reworked and should be more intuitive. You should also be able to check the results of your Enhancements more easily. The Trade Info window has been reworked. You can check the information on Imperial Delivery of each region more intuitively with 2 options of Show Name and Show Icon. The Ranking window has been reworked to allow you to see all of your ranks at the same time, instead of having to go through each tab individually. In the new ESC Menu, you can customize your own ESC Menu through ESC>My Menu>Edit Menu. Along with My Menu, You can find additional functions in the Content, War/Co-op, Info/Function, and Community categories of the new ESC Menu. With the roll-up type menu buttons, Recommended Content section at the bottom of the new ESC Menu will keep showing the various contents available to enjoy in Black Desert Online. A new function, Notepad, has been added to the ESC Menu. You can have up to a maximum of 15 Notes, or delete Notes in the Notepad window. You can write up to a maximum of 2,000 characters in a single Note. Each Note will have a box you can check to pin the Note to your game screen. You can edit your pinned Notes. You can use the Sticker UI button to drag Notes out of the game window. The Settings window has been reworked. Previously this window contained the options for Screen, Audio, Game, Input, UI HotKey, and Performance categories. This has been reorganized into primary categories: Performance, Screen, Sound, Game, and Interface. The option ‘Simple Setting’ has been added to the Settings window. 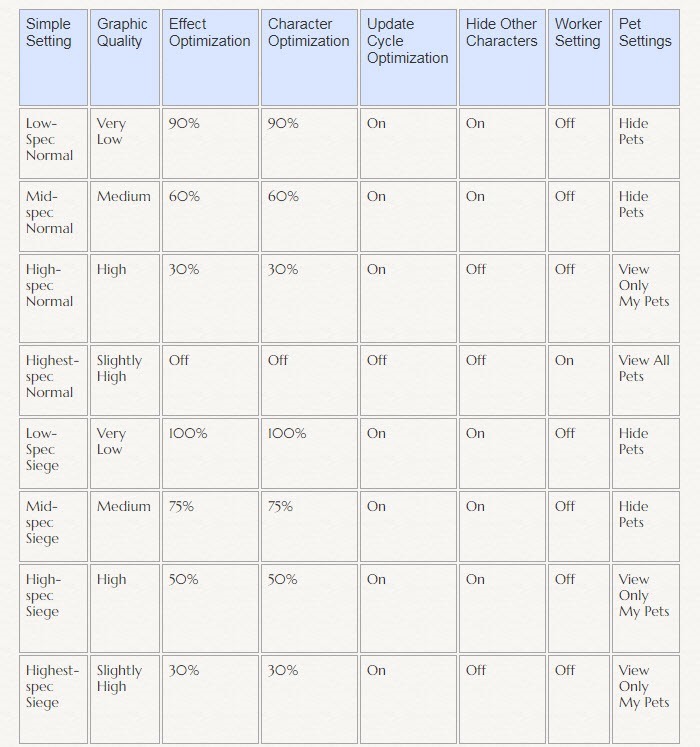 Allowing for the selection of 8 preset game settings, and 2 additional slots for custom settings, which can be uploaded and saved from the bottom right of the Settings Window. Please Note: The graduated scroll-bars in the Settings window are divided into twenty sections. The left end of the bar is 0% and the right is 100%. When an item has been registered in the Marketplace that is either an item you registered for notification, and/or that you have placed a pre-order for, a notification will now appear. When clicked additional related information will be shown. Within the additional information window, up to 20 notifications will be shown, these notifications can also be cancelled from this window. The notifications listed in the additional information window will be reset when the game is loaded again after re-logging or changing servers. When there is a notification alert, the notification icon will be visible at the bottom right of the screen. A Warning message will appear if a Pre-order price has been set to a value that exceeds triple the amount allowed for the maximum registration price of an item when placing the Pre-order in Marketplace. Fixed the issue where the tooltip was not being displayed when mousing over the normal rank icon in the Guild Member Status window. The font size of the Guild Funds amount within the Guild Shop window has been increased. The Spanish language option has been added to Chat Channel in Settings. Fixed the issue where the names of certain items in Marketplace were overlapping with Marketplace notifications due to the text length. Notices for Marketplace items will show up even if those items were sold via Pre-Order. Fixed the issue where the Help button on the Lv.50 Guide Window would not bring up the relevant page when pressed. Fixed the issue where Node Forts could be installed on top of the roofs and stables in 2 Serendia Swamp Node War Areas: Northwestern Gateway and Eastern Gateway. Any forts and annexes built in the above-mentioned locations have been removed. If there was a Node War in progress, the guild possessing the node will still remain as the victor of the node. Fixed the issue where the Long-tailed Rosefinch would not sit on the character’s shoulder when either Hedgehog or Snowkid was also summoned simultaneously. Fixed the graphical glitch causing pets to appear outside of the Residence while in the Place Mode.